For a few months now, I've been keeping some secrets under wraps but now it is time to make the big announcements. As my loyal readers might remember, I've been working on designing some of my own quilt patterns to some day make available to the public, both through purchasing directly from me and for industry wide distribution to local quilt shops. While I'm not ready yet to release my first pattern, I've been also preparing for some other changes that will be part of this new and exciting direction my quilting life is taking. I love my blog and I totally believe that walking into my studio and looking at my fabrics ARE just like opening a box of crayons for the first time....so full of endless possibilities. But my blog name isn't actually suited for a pattern company name. So after a lot of thought and a few opinions from some trusted quilter friends a whole new name and look to my blog is in the works. Here is just a tiny peak of part of the new look. The designer is almost done tweaking it and the big reveal will be in the next few days. But that isn't all!. I have even bigger news to tell you about. A couple of months ago, I had one of those light bulb moments while flipping through a quilt block book trying to come up with an idea for another quilty event. I was so excited about the idea that I immediately sat down with graph paper and colored pencils to draw it out. I've already had my second light bulb moment and am drafting out my second possible design for them. Never in a million years would I have ever thought when I started quilting 5 years ago that I'd eventually be designing patterns and making quilts for one of the biggest fabric companies but here I am. It truly proves that you never know where life will take you and just like a brand new box of crayons, it is full of possibilities. So far, I'm enjoying the ride. Congratulations! I do love your Crayon Box name but look forward to your new design and new patterns. Go for it! Michelle I am sew proud of your success. You do so much for others both on your blog and off without ever tooting your own horn. It's one of the reasons I follow your blog and that we have become friends! So let me blow that horn for you, TOOT TOOT! What fun!!! Congrats! Looking forward to watching your changes evolve! Woohoo!!!! I love the new logo with the "selvage" edge. Congratulations on the new Chef title too. This is so exciting. How exciting. I like the new logo. Who is working on your design? Congratulations! Can't wait to see your new patterns. Congratulations. This is so exciting for you and I wish you every success. Looking forward to following the journey. How exciting! I can't wait to see the new logo. Congratulations on your patterns. I will be watching for those too. Whee! I'm so excited for you! 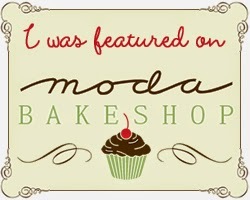 That's a great opportunity to bake for Moda! Can't wait to see it! Love it. As I knew I would!